Sometimes I'm a nice wife and I'll ask Jason what he wants on the meal plan for next week. Lately, it seems his answers always boil down to anything having to do with seafood. Shrimp, fish tacos, tuna melts. Surprisingly, my 13 year old picky eater has been agreeing with these suggestions, so last week when I noticed that a lot of stores were putting seafood on sale (probably for Lent), I picked up a few salmon patties for them to enjoy. I have never been much of a seafood eater, so I wasn't sure how to properly cook the patties. Thankfully, Golden Blossom Honey had a tempting sounding Honey Mustard Crusted Salmon recipe that looked easy enough to toss together. Since I never cook fish here, I had to ask Jason if I made it correctly. He assured me that it was "perfect", so follow the recipe to a T and you're guaranteed tasty results. Because the weather has been pretty nice lately, I decided to fire up the grill and cook up some veggie kabobs to serve alongside the salmon patties. You could brush the kabobs with more honey mustard sauce before grilling for an extra tangy dinner treat. What's one thing your family requests to be put on your meal plans regularly? Veggie kebabs do look good! Back when me was a kid, I think roasted potatoes was on the menu once a week always. What a delicious recipe! I do not cook salmon often, so having this recipe handy would help as my boys love salmon! Good grief! I am so in love with all these great honey recipes you've been sharing with us over the past few months. Honey is so delicious in so many recipes. Om nom nom. We make salmon every week and honestly its getting boring! 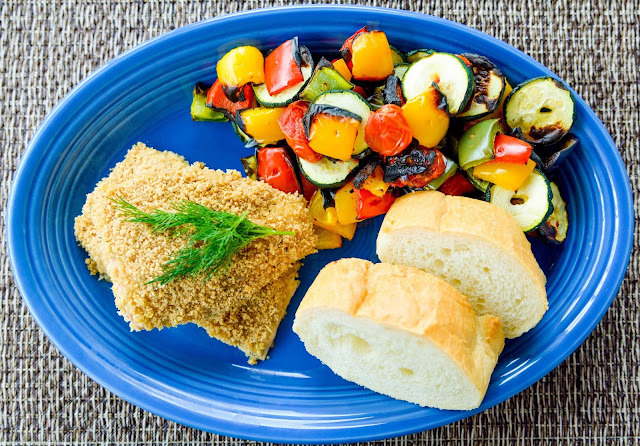 I never thought to bread my salmon but this recipe looks great! I am going to pin this one to try next week on salmon night. I haven't had salmon in awhile, and I love it. This looks wonderful The veggies look wonderful as well. I love salmon (always keep wild salmon in my freezer!) and best of all my kids eat it too. This looks SO GOOD and much better than my boring recipes. I'm going to try this, tonight actually! Seafood and I wouldn't get along, unless you were out to murder me lol Should I be giving the Halloween Nazi such ideas? Wow this looks delicious! I love anything honey mustard! My DIL only eats seafood and chicken. Salmon is one of her all-time faves. I am always considerate of her when I cook and she's around. I bet she'd love this one! I love seafood but I rarely cook it. This recipe looks like something I could follow! This recipe looks awesome! I plan on sharing it with my dad; He loves to cook and is also on a Paleo-like diet for quite some time now. I am sure he will love this recipe. Sounds like something my Bollywood Princess would like a whole lot. oh man, this looks so good. i love salmon. i will have to try this out. This salmon recipe sounds totally delicious! I would love to try this, but with some gluten free bread crumbs because of my food allergy. This looks absolutely delicious! I love how easy it sounds! Everyone in my family is a meat lover, but we do have fish and other seafood (mostly shrimp) on occasion. I'd love to try this recipe of yours. I am sure my family will love it, which is good. We'd be able to get our healthy oils with salmon! I love salmon and it's so nice that there are so many recipes that can help us enjoy it. This is definitely something that I wouldn't mind trying out! So good! I buy that honey brand all the time. This recipe is definitely going to be on top of my menu list for this week! I've only ever cooked grilled salmon. This recipe looks delicious and I'll have to give it a try. All of these different ways to make food with the honey! 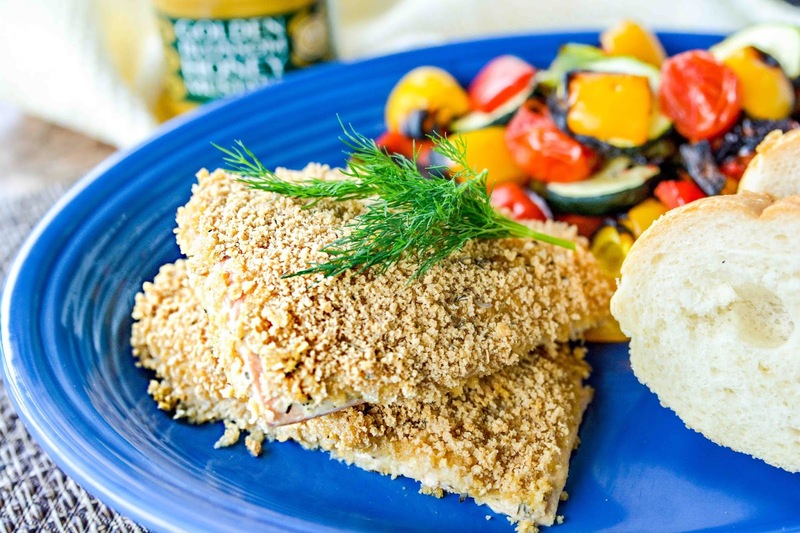 great idea with this honey mustard crusted salmon yum!